Alfalfa is a perennial legume related to the pea and bean family. Being a legume, alfalfa provides excellent levels of good quality protein and due to a deep root system also provides naturally occurring minerals. Dengie alfalfa is harvested at a young age and then high temperature dried. This helps to retain nutrients and provides a consistently clean forage source. As a digestible source of fibre, when fed as part of a nutritionally balanced diet, alfalfa makes a great addition to any rabbit ration. Alfalfa for Fibre – As a herbivore, fibre is crucial for the rabbit’s digestive health. Low levels of fibre, combined with high levels of cereal in the rabbit’s diet can result in digestive disturbances such as diarrhoea. Feeding fibre helps to maintain peristalsis as well as maintaining gut pH. This promotes a favourable gut environment that allows beneficial bacteria to thrive. Dengie alfalfa is naturally low in sugar and starch and is harvested when the plant is young. This means that alfalfa provides a more digestible source of fibre compared to plants cut at a more mature stage, such as timothy hay. In practice this means that alfalfa can make more of a contribution to a rabbit’s energy requirements, which in turn can help reduce the reliance on cereals. Feeding Dengie chopped alfalfa also promotes increased chewing time compared to feeding cereals. This not only helps with efficient teeth wear but also promotes natural feeding behaviour helping to keep your rabbit occupied for longer. Alfalfa for Protein – As a legume, alfalfa provides excellent levels of good quality protein including the essential amino acids lysine, threonine and tryptophan. Protein is important in the rabbit’s diet for growth, reproduction, cell renewal and tissue repair. Alfalfa for Vitamins and Minerals – Hutch kept animals may be vitamin D deficient as naturally sunlight would promote vitamin D synthesis. Alfalfa provides a natural source of vitamin D, therefore adding alfalfa to the ration may be particularly beneficial in the winter months. Rabbits require a ratio of 1.5-2:1 calcium to phosphorus in their diet for optimal bone and teeth strength. Cereals provide a ratio of 1:5 calcium to phosphorus whereas alfalfa provides a ratio of 5:1. In practice this means that alfalfa can be used to naturally balance cereals in the diet. Alfalfa is also an abundant source of β-carotene which is a precursor for vitamin A and is important for fertility and the survival of young rabbits. Alfalfa also supplies vitamin E which is an important antioxidant. Alfalfa for Essential Fatty Acids – A rabbit’s natural diet would provide higher levels of omega-3 than omega-6 essential fatty acids. Using a fibre based ration that includes Dengie alfalfa helps to maintain this natural ratio. This is important as research suggests that elevated omega-6 puts the body in an inflammatory state increasing the risk of allergies and skin problems. As alfalfa provides good quality protein, naturally occurring vitamins and minerals and promotes a naturally good ratio of omega-3 it is an excellent choice for showing success as all of these factors result in fantastic skin and coat condition. Dengie Medi-Bed is chopped, dust-extracted wheat straw bedding. Medi-Bed rots down easily and is available in a 140L bale (approx 25kg). 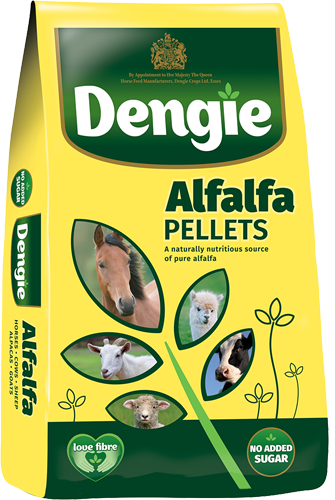 Dengie pure alfalfa products can be fed at 15-20% of the total diet whilst the Hi-Fi range can be fed ad-lib. Contains pure alfalfa and are a high-fibre source for horses, ponies and other animals, such as cattle, sheep, goats and camelids. Alfalfa-based feeds can be fed to a wide range of animals including camelids. 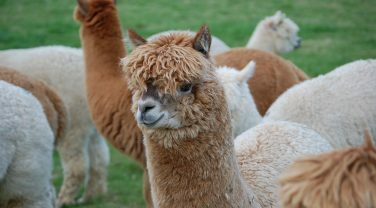 So which Dengie feeds can be used to feed your alpaca?